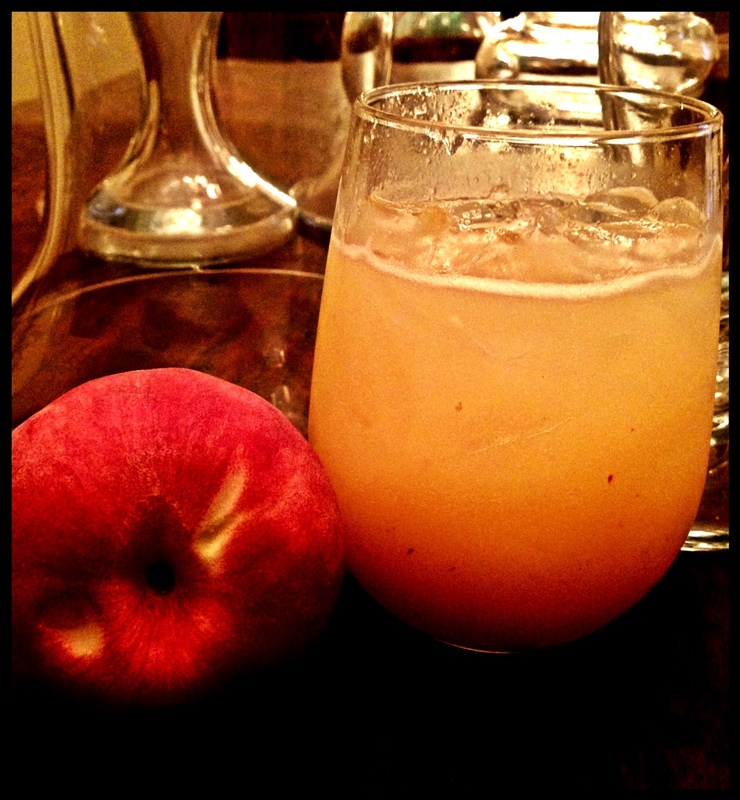 The Madelyn: Vodka Cocktail with Fresh Peach Puree | Kitchenpants! My friends have some pretty awesome moms, too, and we love to regale each other with our hilarious mom tales and capers. One of my favorite mom tales comes from my friend Jeremy who served in the Peace Corps in Ukraine. His mother came to visit and hilarity ensued. Our moms are all such characters! When it comes to characters, Madelyn Atkins is right up there. Madelyn is my friend Emily’s mom and she passed away two years ago. As you know, I love love love all things Georgia and Madelyn was a true southern lady if ever there was one: Stern and stoic, but charming and graceful at the same time. One of my favorite Madelyn sayings is “Don’t be ugly!” which sounded like “Don’t bay ugalay!” when she said it. When I go to Savannah, Emily likes to take me around and make me sample all of the various wacky cocktails that Southerners make. ** Artillery Punch, Call A Cab, Purple Passion…the list goes on, and if you drink yourself down the list you might end up sleeping in a bathtub (wasn’t me!). I thought it only fitting to whip up a cocktail for Madelyn to celebrate Mother’s Day. This recipe will make one cocktail. Multiply the ingredients to make a batch. 2oz Vodka – Grey Goose! 2 tbs Peach Preserves – I used all-natural preserves. Champagne – Any kind you like. The more dry the Champagne, the less sweet the drink. Peel the peach. You can leave a little skin here and there. Cut the peach up and discard the pit and ends. Place the peach in the blender (or whatever you are using) along with the preserves. Blend until liquefied. You want the mix to be a thin as possible. Place a few cubes of ice in your shaker to cool it. Let them sit for 10-15 seconds. Prepare a glass with ice. I used a stemless wine glass, but a rocks glass will work too. Add the vodka to the shaker and add the peach puree mixture on top. Pour the mixture from the shaker into the glass. The strainer on the shaker might not work because of the thickness of the mix. Instead, flex your bartending skills: Take the top off the shaker and insert the back of a pint glass into your shaker to be a barrier against the ice. Carefully add champagne over the top of the mixture in the glass to your liking. Stir lightly with a straw and enjoy! The Madelyn tastes sweet, but packs a punch…just like the real Madelyn herself. Cheers! **Bible Belt? Pshaw. I live down below the Mason-Dixon line and although there’s no question that religion rules…there’s also no question that Southerners like a stiff drink. Thank you! Brought tears to my eyes😘.